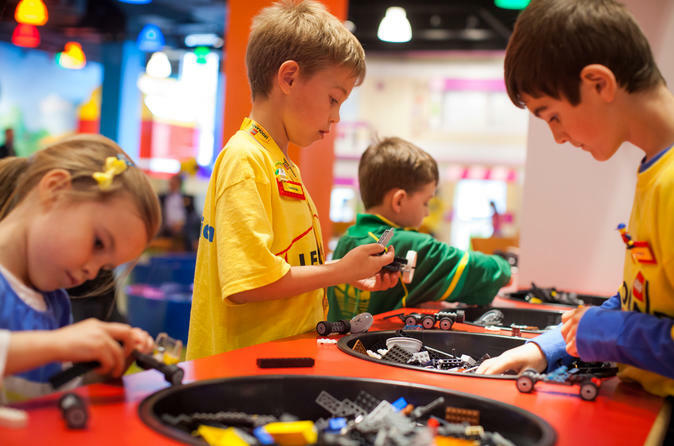 Unleash the kids - and their imaginations - at LEGOLAND® Discovery Center Boston. With this admission ticket, you'll have access to plenty of entertaining attractions to keep the whole family busy for a day of LEGO®-building fun. Visit a virtual LEGO Factory, find Boston landmarks at Miniland, build with soft bricks at the DUPLO® Farm, or turn up the volume at LEGO Racers. Rest your legs at the 4D cinema before tackling LEGO rides like Merlin’s Apprentice! Located at Assembly Row in Somerville, less than 3 miles (5 km) from Boston, LEGOLAND Discovery Center offers free parking and is accessible by the orange line on the MBTA at Assembly Station. Once inside, venture through the Minifigure entrance, and strike a pose for a photo shoot with a custom LEGO background. Then take an elevator to the LEGO Factory for a virtual tour of the actual factory in Denmark. After learning how LEGO bricks are made and playing a game, hop on a chariot at the Kingdom Quest Laser Rider. Use your laser to zap skeletons and ogres so you can rescue a princess. Make you way to Miniland, where you’ll find iconic Boston landmarks made out of LEGO. Can you find the Prudential Tower, Logan Airport, the State House, Quincy Market and Fenway Park? Next, check out the DUPLO Farm, where little tikes can go to work, or enjoy the play kitchen and living room karaoke at Olivia’s house, based on LEGO Friends. In the LEGO Fire Academy and LEGO Construction Site play zones, young ones can climb to the top of walls and go down the slide, or build with giant soft LEGO bricks. Don’t miss pedaling magic bikes at Merlin’s Apprentice! Please note: LEGOLAND Discovery Center Boston is a children's attraction; to promote a safe and family-friendly environment, adults cannot enter without being accompanied by a child.